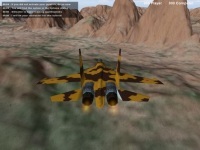 Airblast is aerial combat simulation game where you can control the aircraft either using keyboard or joystick. Airblast is the winner of PGD (Pascal Game Development) competition in 2005. At first, Only tutorial menu is available, which is the training mission to learn the basics control of the fighter plane. After playing the tutorial exercises, the Instant Action menu containing game modes will be active and you can play a duel against enemy aircraft. The Tournament menu is not active in this version. 1 vs 1 = combat against single plane using missile and weapons. 1 vs 1 Furball: only use weapons. 1 vs 1 Firestorm: use more missiles. Endurance: patrol the area with your wingman. Arrow keys = drive the plane. Page up / Page down = change weapons to missiles or vice versa. ... Other control can be found in the Options menu.